Concerns about the impact of Brexit on the agri-food market meant it was at the ‘top of the agenda’ for International Trade Secretary Liam Fox, according to AHDB chief executive Jane King. Speaking after her return from a trade visit to China with Dr Fox and the Prime Minister, Ms King said she was concerned about the ability of the industry to thrive in the shifting landscape. “The Department of International Trade (DIT) wants to grow British trade and can see countries, such as China, are very interested in British products,” she said. And she was hoping Dr Fox would help AHDB drive the message of the importance of productivity and innovation. “We know the sector is going to be challenged as we know we are going to see a decline in farm support,” she said. Chinese consumers were switching to more westernised diets as they became more affluent, with a keen interest in the British brand. The trip, which aimed to boost Sino-British relations, saw eight people from the food and drink sector sitting alongside other key figures in UK business, such as Jaguar Land Rover and HSBC. The Prime Minister announced last week British beef would be back on the menu for China within the next six months after they agreed to lift the BSE ban on British beef, introduced in 1996. And Chinese Premier Li Keqiang said UK produce, including regional cheeses, would be allowed in to give consumers access to higher-quality agricultural products. He added Sino-UK relations would not change because of Brexit, but China’s door would be open to Britain ‘wider and wider’. 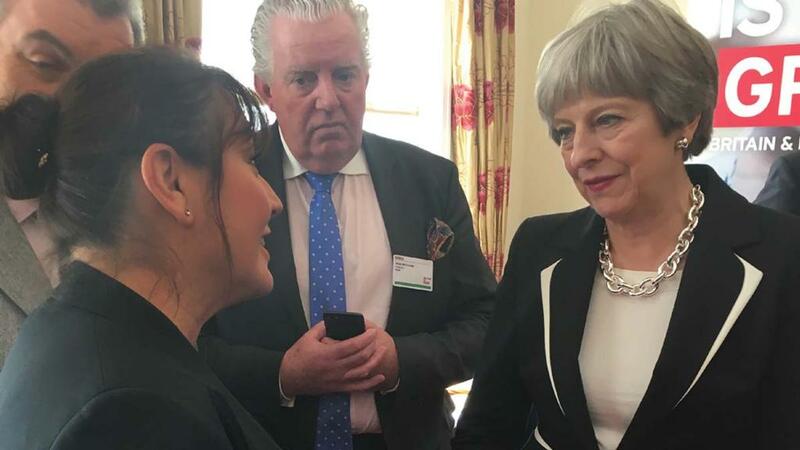 Ms King felt she had been able to push the importance of agriculture to Theresa May. “The point I made to the Prime Minister was if we look at the kind of trade deals done, British beef does not add up to the greatest benefit to the UK,” she said. AHDB’s international market development director Dr Phil Hadley said markets such as China were important in the context of Brexit and estimated the beef trade could be worth £250 million after the first five years. He said: “As we move to become a free trading nation, it is absolutely critical we have as many markets as possible. And while Europe would continue to be an important market, it was crucial to mitigate any impact Brexit may have. Dr Hadley added it was important to find the best market for every part of the carcase to maximise returns, with China opening opportunities to sell fifth quarter cuts. There could also be opportunities for malting barley exports, as well as growing exports of wheat. The pork industry had already seen the benefits of increased market access as UK exports grew 6 per cent last year to 46,000 tonnes, despite Chinese import demand dropping due strengthened Chinese domestic production. Dairy was also a major area of interest for the Chinese market, with many consumers interested in goat and sheep milk. “They are getting more switched on to dairy. It is growing,” said Dr Hadley. And Dr Hadley said the deal showed there needed to be an emphasis on food safety and quality, with the next step being Chinese inspectors to review the UK’s controls. “Chinese consumers do rate safety highly as they have had a number of food scares,” he said.